Keep your watch intact, useable, and handy! Watch Pocket uses YOUR watch….the one you don’t use because the band is broken, you don’t like wearing it, you don’t want to scratch it up, or it’s a HAZARD to wear at your workplace. 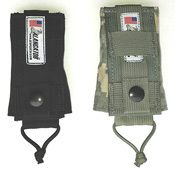 Just attach Watch Pocket to your belt, MOLLE, pack strap, or anywhere else you like, pull the tab, note the time, release the tab and your watch returns safe and sound into the protective pocket. It's that simple. Working folks: How many times have you taken your watch off and put it in your pocket to save it from damage while you work? Or don’t wear it at all? Then you spend all day digging in your pocket or wondering what time it is because you can’t reach into your pocket without a hassle? Have to remove your gloves or your hands are covered in grease? Hazardous to wear one? Against the rules? Military: Same issues as above…..but what about that reflective crystal face making you a target? Or that Velcro “RIP” sound of your cover? Having to peel back your sleeve to access your watch and it busies up two hands or you just can’t get to it? Watch Pocket was originally designed by a combat veteran for his personal military tactical use – and it works! Tried, used and proven. 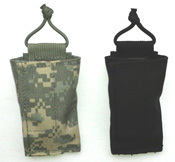 Attaches to belt, pack strap, MOLLE, pen slot of your pocket flap; any other convenient location up to 3 inches wide.